A report by John Wenzel for the Denver Post. Gregory and Mathenee Treco moved with their family from Nassau, Bahamas to Aurora when they were kids — Gregory was 13 and Mathenee 6 — and grew up in Colorado before leaving to chase their show-business dreams. All that travel helped prepare them for their high-profile theatrical work, which has culminated in the brothers starring in separate versions of the Broadway smash “Hamilton” — the touring edition of which runs at the Buell Theatre Feb. 27-April 1. 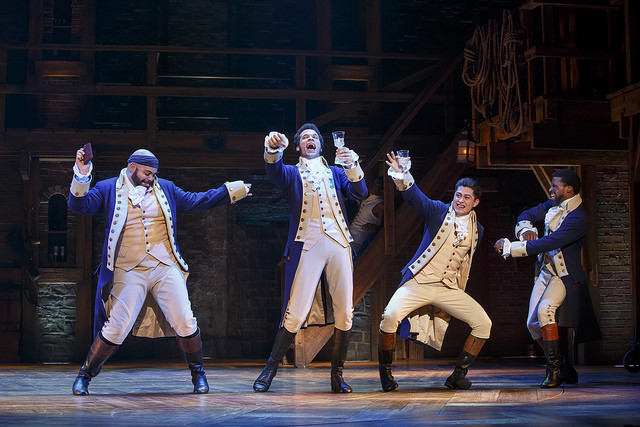 The immense popularity of the Tony-winning musical — which tells the tale of founding father (and West Indies immigrant) Alexander Hamilton through a mix of hip-hop, dance and other refreshingly contemporary stage language — means that this Denver visit likely won’t be its last. But the long sold-out Colorado premiere (minus the daily, $10 ticket lottery) puts plenty of attention and pressure on the cast, including the experienced Mathenee, who will be appearing in the Denver version. We caught up with Gregory, who plays Aaron Burr in “Hamilton’s” Chicago-based production, and Mathenee, who formerly appeared on “American Idol” and plays Hercules Mulligan/James Madison in the version coming to the Buell, via email to talk about the challenges, rivalry and rewards of being in the hottest stage show around. “Hamilton” cast member Mathenee Treco. Q: When you talk about “Hamilton,” what do you talk about most? Is there much sibling rivalry? Gregory: Mathenee and I have talked about everything! Our processes were vastly different; him being an original company member of the “Angelica” tour (the cast that’s coming to Denver) and me entering as a standby in the Broadway company. Those entrances into this beautiful piece couldn’t be more different. But what I think we speak on most is how demanding the show is both physically and emotionally. The emotional range is this piece is astounding. Every night you experience both extreme joy and extreme sadness. But also how physically demanding this piece is. If I never have to climb a staircase again I wouldn’t be mad. Mathenee: This show is a lot! There is so much hype and anticipation. You can feel it from the audience every night. You just hope you can go out there and give the audience the experience they’ve been waiting for, and I have a responsibility to give them the best performance in me. Q: What are your favorite parts of the show — and what’s a part you feel you know backward and forward? Gregory: At this point I feel like I know the entire thing backward and forward. Though I currently play Burr full-time in Chicago, I was the standby for Burr, Washington and Lafayette/Jefferson for a year. So my knowledge was from many angles. I am also a fan of the show. I learned every word before I was even in it. “Satisfied” is the part that I know the most that is actually not my song! I would love to perform it one day. Mathenee: I love “Yorktown.” It’s a big moment in Act 1. Spoiler alert: It’s when we win the war! I’m center stage, rapping, dancing with my cast mates. It’s my favorite! After performing this show over 400 times, I’d say that I know everything backward and forward, too, and then some. Also, I love my direct connection with the show. I’m an immigrant, telling the story of an immigrant who shaped a nation, and a financial system that influenced the entire world. Q: There’s much discussion these days about representation in culture — on screen, in music, on stage — and I’m curious if you think “Hamilton” helped open doors for things like the huge success of Marvel’s new “Black Panther” movie? Gregory: “Hamilton” has at least unlocked a great amount of these doors by giving such a large platform for people of all races. There is a moment in the opening number where we all stand side by side in what is called “the timeline.” All races. Colors. Sizes. Orientations. Equal in this one moment. That will never be lost on me, as the audience gets to see us all stand as equals for a moment. This is what “Hamilton” has done. Every day approximately 7,500-9,000 people will see that visual. It has to change something. Q: What affected you most in Aurora growing up, good and bad? Gregory: I would never be where I am if it wasn’t for the guidance I got from my high school teachers and the support of my family. Mathenee: Coming from a predominantly black nation, I was never really exposed to much racism. After the move to America, I was picked on, harassed and assaulted many times while growing up because of the color of my skin. Positively, I was exposed to so much creativity and opportunity, too. I know that I wouldn’t be the artist I am today without my experiences here in America. Q: When and how did you get into theater? What were your favorite school-theater moments? Gregory: I went to Eaglecrest High School in Aurora. At the time, it was arguably the best school in the state for theater. This was a public school! (Three of my classmates alone have starred in Broadway shows.) The program was spearheaded by Jennifer Condreay and Jerry Vanderdoes, who are still teaching. My favorites were “Evita,” where I played Che, and “Chess,” where I got to play the American. The latter, we were fortunate enough to take to the International Thespian Conference, which is one of the greatest honors for a high school production. Mathenee: I started doing theater in the first grade after my teacher noticed I was a class clown. I was lucky enough to go to an elementary, middle and high school that were heavily into performing arts. I was blessed with so many incredible teachers who encouraged me to create my own art. It started with dance concerts and directing plays in high school, to now working professional as a choreographer, songwriter and a producer as well. Q. What’s an average show day like for you, and what do you do to stay limber and energetic for it? Gregory: Today I will warm up, train with my personal trainer, steam for my voice, have physical therapy at the theater, eat, take a quick pre-show shower, stretch, then SHOWTIME! Mathenee: I sleep as long as I can. I usually slowly warm up my voice throughout the day, and arrive at the theater 30 minutes before the show. I am always listening to music before the show to get my energy up. I warm up my body with some stretching, and then it’s showtime! Q: What do you most enjoy doing in your off time these days? Mathenee: I’m always working on music. I’m currently working on my next EP, which should be released in the next few months. I’m also a part of the creative team for a new musical that I’m very excited about. Also, I have recently become obsessed with escape rooms! If you haven’t done one, do it now. Q: How do you think Colorado audiences are going to react to “Hamilton” when it premieres here? Gregory: Colorado audience are gonna flip. Denver is a smart town. An open town. So I can only imagine the ovations at the end. And they also have the buzz of a hometown boy starring in it. Mathenee: I’m sure the audience is going to be hyped just like in all the other cities. Hey, maybe they’ll be even more excited because I’m repping for Colorado!